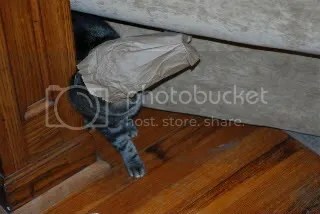 When not shoving her face into paper bags, climbing into cardboard boxes or licking plastic bags, Tabitha is apparently a genius at tricking Piper. Last night, Matt watched as Tabitha looked on at Piper who was in the window. She wanted a space in the the window but Piper is rude. So instead of giving up in sadness, she decided that biting him on the tail was her next objective. His response was, “ow” and he jumped down, chasing after her. Here’s where her smartypants exceeded expectations: She ran past the table, made a sharp left and came back around, and then jumped up into the window sill, leaving Piper in a befuddled mess. Superb.